You're invited to join the University of Arizona for the 2017 Race in the Desert! 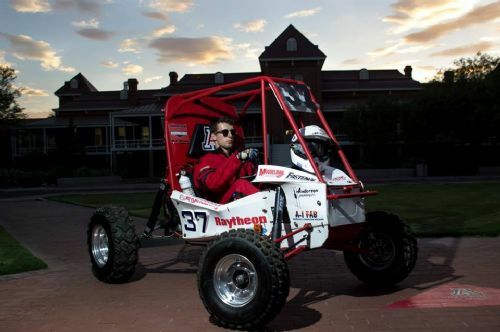 I'm Geoff from the University of Arizona Baja Racing Team. 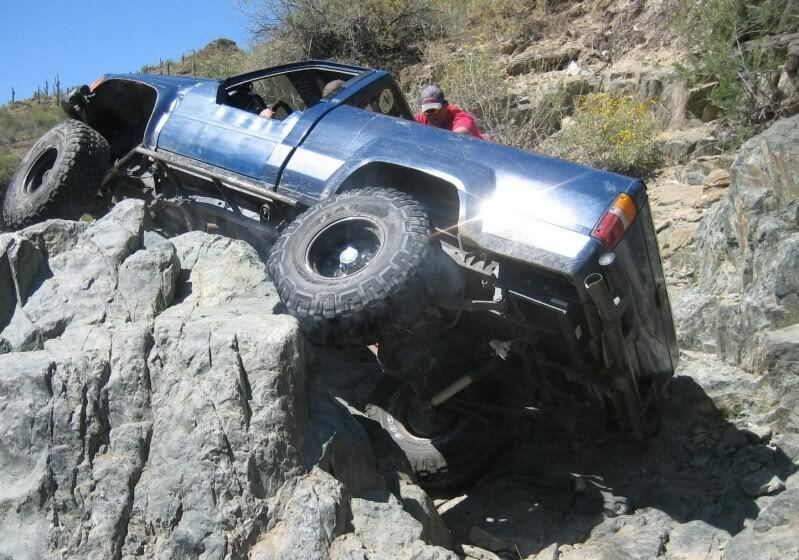 We are planning an unsanctioned endurance race over Veterans' Day weekend on the 11th, in southern Arizona. After the race we'll have a BBQ, bonfire, a chance to socialize, and games. Teams can camp out with us or grab a hotel near the track if needed. There will be an unmodified class with as close to SAE regulation rules as possible, and a Superclass with modified Briggs 10Hp engines racing a 4 hour endurance race at the same time. We're bouncing around the idea of also having a short night race, but that would require teams to install headlights and reflectors on their vehicles. Let me know if there is interest in this! Feel free to contact me a uabaja@gmail.com if you have any questions. I will be posting updates on here soon! I'm a fan of night racing! Be safe! Here are the rules for the event regarding your vehicles! Let me know if you have any questions! 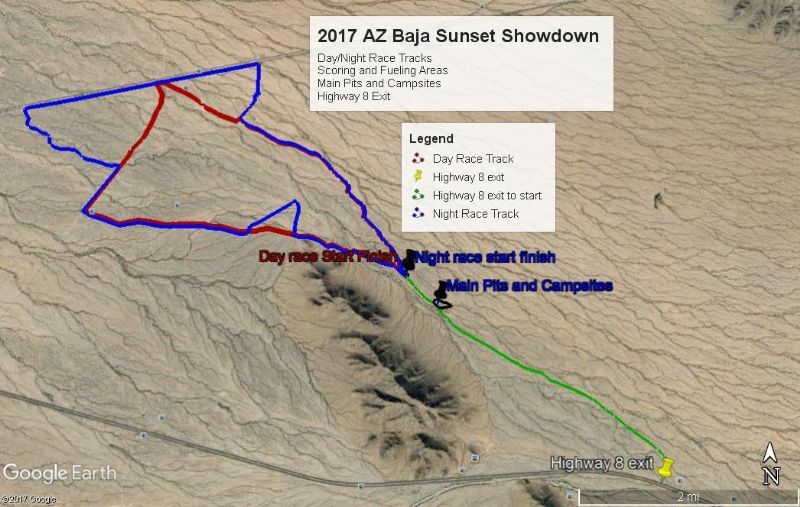 The event will start Saturday morning (11/11/17), with the endurance race starting around 1:00pm and ending when the sun sets. If there are enough Night Race participants, it will run for one hour, starting shortly after endurance ends. All rules mentioned below will be regulated by race officials, who will have final say over all decisions.  Frames must follow BAJA SAE official design rules of 2010 and newer.  Retroreflective tape must be attached to the Side Impact Member, Front Bracing Member,and the Aft Bracing Member to insure visibility. By now you've heard of the event we are planning for the 11th of November. 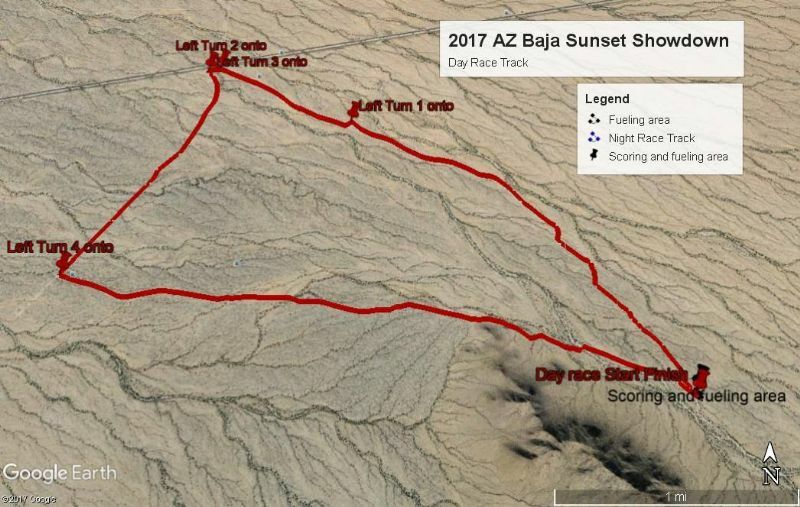 It will be held 10 miles east of Gila Bend on BLM land. Since we will be operating on government land all the Baja cars must have spark arresters, and be driven by a licenced driver. 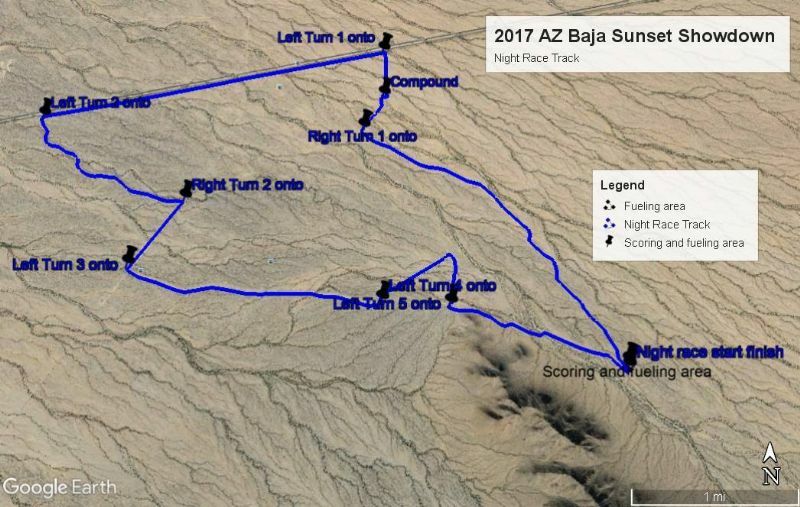 There will be a 4 hour endurance race on a 8.3 mile track where the car with the most laps wins, and a night race on a 10.5 mile track where the car who finishes 2-4 laps (TBD) first wins. The road to the track is not technical, and we should be able to get trailers and most cars within a mile of the track. We will provide the chase/tow vehicles for the endurance race, but feel free to bring along any UTV, Quad, dirt bike, or trophy truck you have lying around. We're trying to get a hold of a MyLaps tracker, so dig out those transponders. If you don't have enough for the cars you're bringing, or if we can't secure a tracker please have a volunteer to count laps for your cars. The two classes we will be running are a SAE "stock" class, and a Super Class, where engine modifications are allowed. Both classes will run endurance on the same track at the same time. The rules are detailed below. For those of you who want to run in the night race, there are a few special requests I must make. Since it is only a couple lap course, and because it is at night, each vehicle is required to have its own chase/tow vehicle provided by your team, and have radio contact. I don't want anyone breaking down out there and getting lost out there. 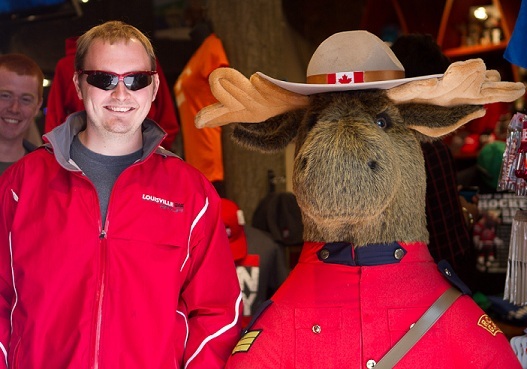 The night race is restricted to SAE Class Baja and has a few special rules detailed below. I've set up the race tracks for next months race using google earth. Enjoy the pictures of the tracks below. The day race track is ~9 miles, and the night track is ~14 miles. Image didn't come through correctly. Here is the track layout. Sorry it didn't work the first time. Hopefully you guys have begun modifying your Briggs engine for the superclass race. We fired ours up for the first time last night. Can not wait for November 11! Sorry, video was taken on a 19th century potato. Did this happen? Anyone have any pictures?